Rev. 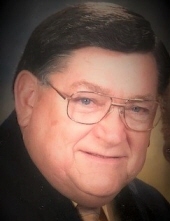 Jimmy R. Rogers, age 80, of Old Washington, Ohio, walked into the presence of his Lord and Savior Jesus Christ to receive his eternal reward on Tuesday, March 19, 2019, surrounded by family, defeating his battle with Alzheimer’s Disease. His devotion to his family, church family, and his steadfast love for the Lord supported him in his physical struggle, and gave him strength, that even in his weakness of mind, his testimony shone through. Jimmy was born September 22, 1938, to the late Charles D. and Eleanora P. Rogers in Grafton, West Virginia. His family moved when he was 12 years old to Warren, Ohio, where he began his love for sports, and where he graduated from Warren G. Harding High School in 1956. It was during those years that he met the love of his life, Martha (Peggy) Rogers. They were married on March 1, 1958, and welcomed four children to their marriage, who he raised with love, patience, discipline and humility. In December, 1957, Jimmy gave his heart to the Lord at Warren Free Methodist Church and felt called to full time ministry. He and Peggy attended Spring Arbor College in Spring Arbor, Michigan, where he graduated with an Associate’s Degree in 1962. He then went on to finish his Bachelor’s Degree at Malone College in Canton, Ohio. In 1987, he earned his Master’s of Divinity at Trinity Theological Seminary in Indiana. His first church appointment was in Mayfield Heights, Ohio, in 1963, and he went on to serve six churches in the Free Methodist conference from 1963-2002. Following his retirement, he continued to pastor at the Ava United Methodist Church until October of 2017. While serving his Lord through his ministry was his greatest passion, his family claimed a close second. Jimmy & Peggy were blessed with four beautiful children who adored him and learned from his example as a parent and grandparent. No event was too small nor too insignificant to him. He loved watching his children grow into adults who love and serve the Lord as well as live out the same examples as taught by their father. Jimmy never missed an opportunity to attend a sporting event, music concert, or anything involving his grandchildren. He lived fully what he taught and preached. While we, his family and friends, will miss him dearly, we will cherish the memories we had with him. He left an example to help us as we move forward as believers. In addition to his parents, he is preceded in death by his wife, Martha S. “Peggy” Flannery Rogers, whom he married March 1, 1958, and who died February 20, 2016; one son, Jimmy Lee Rogers, who died July 16, 1990; one sister, Kathleen Stowe; and one brother, Robert C. Rogers. Surviving are his children, Cindy A. (Martin) Van Scyoc of Sarahsville, Darla S. (Todd) Stewart of Caldwell, and William A. (Angel) Rogers of Cambridge; 8 grandchildren, Amanda (Tyler) DeVolld, Jared L. Van Scyoc, RyLee W. Rogers, Andrea L. (Stephen) Hannum, Katlin B. Stewart, Noah N. Stewart, Chloe M. Rogers, and Regan A. Rogers; 3 great-grandchildren, Traxen DeVolld, Haisley DeVolld, and Tayten DeVolld; one sister, Suzanne Mills of Warren; one brother, Jerry (Sue) Rogers of Williamsburg, Virgina; and several nieces and nephews. Friends may call Friday, March 22, 2019, from 2-8PM at the former Center Free Methodist Church in Sarahsville, where the funeral service will be observed Saturday, March 23rd at 1PM with Rev. Danny Neville officiating. Burial will follow at Center Free Methodist Church Cemetery conducted by Rev. Eugene Gill. Memorial contributions may be made to Countryview Assisted Living, 62825 County Home Road, Lore City, Ohio, 43755, or to Outreach Ministries, c/o David Cater, 705 Railroad Street, Caldwell, Ohio, 43724. McVay-Perkins Funeral Home, 416 East Street, Caldwell, is caring for the family. To plant a tree in memory of Rev. Jimmy R. Rogers, please visit our Tribute Store. "Email Address" would like to share the life celebration of Rev. Jimmy R. Rogers. Click on the "link" to go to share a favorite memory or leave a condolence message for the family.